This month's Housing Market Index numbers make this so-called housing recovery appear as if it's picking up steam. Figures released yesterday (Monday) show that homebuilders are both more confident in the current housing market than they were in the beginning of the year and are more optimistic for the six months ahead than they were last year. The index, which is a survey administered by the National Home Builders Association and Wells Fargo & Co. (NYSE: WFC), asks homebuilders to weigh in on the current state of new housing starts and their prospects for the future. Homebuilder confidence is represented on a 0 to 100 scale, with a higher number reflecting more positive sentiment. This month, homebuilders gave current home sales a 52, a 2-point gain on the month before, and future prospects of home sales a 65, also 2 points ahead of the month before. Any number above 50 indicates that more of the participants responded to the survey positively than negatively. In an ideal recovery, home prices would rise in tandem with new first-time homebuyers and homebuyers foreclosed on during the crash re-entering the market. Rising home prices would then be an indicator that middle-income Americans were better off, and more are achieving the dream of home ownership. And those homebuyers would eventually see their return on investment through an appreciation in their homes' values. The current recovery is seeing the value of homes pushed up not by average Americans, but bankers on Wall Street and wealthy foreigners playing the markets. 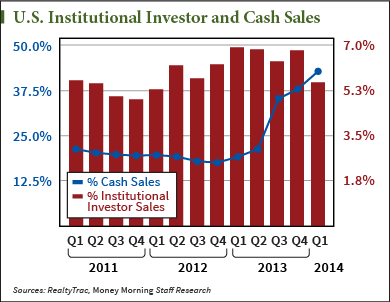 In a low-interest rate environment, big investors are looking anywhere they can to find yield. They have set their sights on real estate.